To be the leading Muslim organization in the world for creating awareness about the dangers of terrorism and it's various causes such as oppression, exploitation and injustice, and unite people to stop terrorism. The Islamic Supreme Council of Canada (http://www.iscc.ca/) and the Muslims Against Terrorism (http://www.m-a-t.org/) strongly condemn today’s terrorism during the Boston Marathon. Those who committed these heinous crimes must be punished to the full extent of the law. “Our hearts go out to the victims of this tragedy. The Canadian Muslim community stands shoulder to shoulder with the American brothers and sisters at this difficult time.”, said Imam Syed Soharwardy, the founder of Islamic Supreme Council of Canada and the Muslims Against Terrorism. The members and the executive councils of the Islamic Supreme Council of Canada and the Muslims Against Terrorism offer deep condolences to the families of the victims. We are all united to fight terrorism and extremism. The unity among peace loving people of all faiths will be the most important weapon against the terrorists and the extremists. We will never let the terrorists succeed. Please contact Imam Syed Soharwardy at 416-994-5467 OR 403-831-6330 OR toll free 1-866-77-ISLAM. 1. 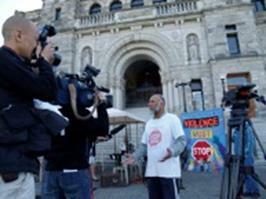 To work with the western media in providing Muslim perspectives on issues related to Terrorism. 2. To establish and strengthen the working relationships with the non-Muslim communities especially Christian community, and help them in understanding the issues and problems of Muslim community. 3. To work with other Muslim organizations in order to stop terrorism. 4. To provide assistance to the victims of terrorism. 5. To help young Muslims in social, economical and educational matters. Calgary) Twenty Imams affiliated with the Islamic Supreme Council of Canada have issued a Fatwa today declaring the attacks on Canada and the United States by any extremist will be the attack on 10 million Muslims living in North America. This is the first Fatwa by the Muslim clergy declaring attacks on Canada and the United States as attack on Muslims. Following is the text of the Fatwa. "When people see a wrong-doer and do nothing to stop him, they may well be visited by God with a punishment." Therefore, it is an obligation upon us (Imams) to inform all Muslims around the world that Muslims in Canada and the United States have complete freedom to practice Islam. There is no single city in Canada and the United States where MASAJIDS (Mosques) are not built. In all major cities Islamic schools provide education to Muslim children about Qur’an and the Islamic traditions. Thousands of Muslims perform Hajj every year and travel to Saudi Arabia with complete freedom and respect. In the month of Ramadan, both Canadian and the United States governments recognize the occasion and greet all Muslim citizens. Muslims pray five daily prayers in mosques without any fear or restrictions. Muslims have complete freedom to pay Zakat (poor due) to the charity or a person of their choice. Muslims have complete freedom to celebrate their festivals openly, publicly and Islamically. Muslims enjoy freedom of religion just like Christians, Jews and others. No one stops us from obeying Allah and His Messenger (Peace be upon him). No one stops us from preaching Islam and practicing Islam. In many cases, Muslims have more freedom to practice Islam here in Canada and the United States than many Muslim countries. In fact, the constitutions of the United States and Canada are very close to the Islamic guiding principles of human rights and freedom. There is no conflict between the Islamic values of freedom and justice and the Canadian /US values of freedom and justice. Therefore, any attack on Canada and the United States is an attack on the freedom of Canadian and American Muslims. Any attack on Canada and the United States is an attack on thousands of mosques across North America. It is a duty of every Canadian and American Muslim to safeguard Canada and the USA. They must expose any person, Muslim OR non-Muslim, who would cause harm to fellow Canadians OR Americans. We, Canadian and American Muslims, must condemn and stand up against these attacks on Canada and the United States. May Allah save Canada, the United States and the entire world from the evil of wrong doers. Ameen. The Islamic Supreme Council of Canada (http://www.iscc.ca/) and the Muslims Against Terrorism (http://www.m-a-t.org/) strongly condemn the alleged plot of terrorism in Canada. Based upon the media reports today two persons have been arrested by the police for allegedly planning to attack Via Rail in the GTA. “We are grateful to those Muslims who helped the law enforcement agencies for exposing such a plot. This was their Islamic and the Canadian duty. It was the right thing to do”, said Imam Syed Soharwardy. We are glad that the terrorism was caught and stopped by our law enforcement agencies. We are thankful for their hard work and keeping Canada safe. We also urge the media not to use this incident to badmouth about the Canadian Muslims and our faith Islam. These suspects will be facing justice and if they are proven guilty of their crimes they will be punished. For questions, please contact Imam Syed Soharwardy at 416-994-5467 OR 403-831-6330 OR toll free 1-866-77-ISLAM.